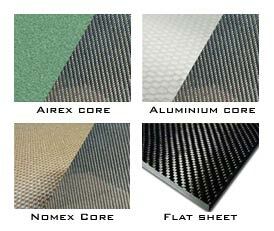 Reverie carbon fibre sheet materials are suitable for a multitude of applications, including flooring, veneers, and decorative trim. Our carbon fibre flat sheet is autoclave cured using 199gsm epoxy thermoset pre-preg surface ply 2x2 twill T300 carbon @ 0/90' fibre orientation. Our sheets are available from 1 ply to 5 plies ranging in thickness from 0.3mm to 1.46mm, with one moulded side gloss, rear side non moulded bag finish (Double sided gloss available on special request). Our sandwich sheets are available in double sided gloss (moulded both sides) with Airex foam, Nomex honeycomb or aluminium honeycomb cores, which greatly increases the stiffness of the sheet. These sheets range from 4mm to 13.5mm thick. This is not low quality only pre-preg carbon fibre sheet (which in certain conditions, or in time will disintegrate and fall apart), we manufacture one of the highest quality pre-preg and AUTOCLAVED CARBON FIBRE SHEET AND PANELS in the world.